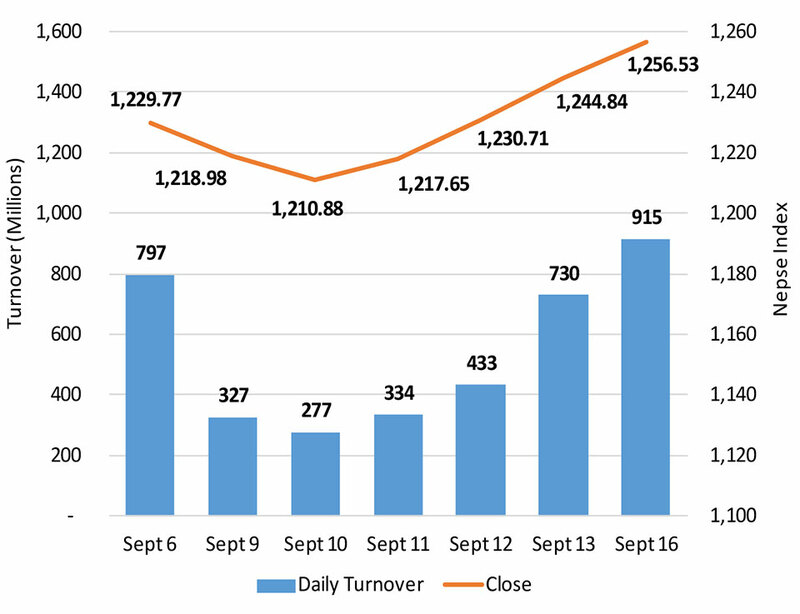 KATHMANDU, Sept 16: Stocks surged in the initial trading hours of the first session of the week. The Nepal Stock Exchange (Nepse) index witnessed a continuous rise to reach to an intraday high of over 1,270 points, gaining 25 points in the afternoon session. The benchmark index, however, retraced toward the closing hours, to close 11.69 points higher at 1,256.53 points. Following the rally witnessed on the day, the index managed to climb to a 14-week high. The broad rally was also accompanied by a significant improvement in terms of turnover. More than Rs 915 million worth of shares changed hands on Sunday compared to Rs 729 million in the previous session. Investors have seemed to gather confidence as the course has been showing signs of the reversal from downtrend with noteworthy trading activity in the sessions of late. All of the market sub-indices closed the day in green with maximum gains coming from Development Bank and Banking stocks. The sub-index of Development Bank rose 1.4 percent, the Banking sub-index added 1.25 percent. Manufacturing & Processing sub-index also closed 1.17 percent higher on the day, while Life Insurance and Microfinance sub-indices ended the day 0.87 percent and 0.54 percent, respectively, higher. Banking scrips remained active on the day. NMB Bank Ltd led the list of companies in terms of turnover. Shares worth Rs 71 million of the commercial bank were traded on the day. Further, Nepal Bank Ltd's scrips logged total transaction of Rs 48 million. Similarly, Kumari Bank Ltd and Nepal Credit & Commerce Bank Ltd posted turnover of over Rs 43 million each. More than Rs 42 million worth of shares of Janata Bank Nepal Ltd also changed hands on the day. Among others, shares of NIC Asia Bank Ltd, Prabhu Bank Ltd and Prime Commercial Bank Ltd were also traded actively. Bhargav Bikas Bank Ltd led the list of advances as the development bank saw its share price post a rally of 9.52 percent. Secondly, Nerude Laghubitta Bikas Bank Ltd jumped 6.72 percent after the micro sector lender announced 20.79 percent dividend to its shareholders. The payout includes 15 percent bonus shares and 5.79 percent cash dividend. Share price of Miteri Development Bank Ltd also went up by 6 percent. Besides, United Modi Hydropower Ltd, Bottlers Nepal (Terai) Ltd and Janata Bank Nepal Ltd were the other top gainers of the day. Conversely, Excel Development Bank was the worst performer of the day as its share price fell by 3.80 percent. The drop came after the Class 'B' bank announced 17 percent cash dividend to its shareholders. Share price of Taragaon Regency Hotel Ltd also fell 3.71 percent as the company reported a decrease in its net profit of Fiscal Year 2017/18 compared to the preceding year. Additionally, microfinance stocks, including Summit Microfinance Development Bank Ltd, Swabalamban Laghubitta Bittiya Sanstha Ltd and Nagbeli Laghubitta Bikas Bank Ltd, also suffered losses of over 2 percent each. In the corporate space, Suryodaya Laghubitta Bittiya Sanstha Ltd declared 45 percent dividend to its shareholders. While 42.75 percent will be distributed as bonus shares, 2.25 percent will be paid in cash. The decision, however, is subject to approval of the company's annual general meeting (AGM). ARKS technical analysis indicates the market adding to its gains for a fourth day in a row. Nonetheless, the index retraced partially during the session after hitting the resistance of 1,270 points. Meanwhile, technical indicators suggest strengthening bullish sentiment in the present context. Hence, the breach of 1,270 points can see the index rise to the 1,300 points.